The $17 billion purchase of Caesars Palace by two private equity firms was a bad bet. 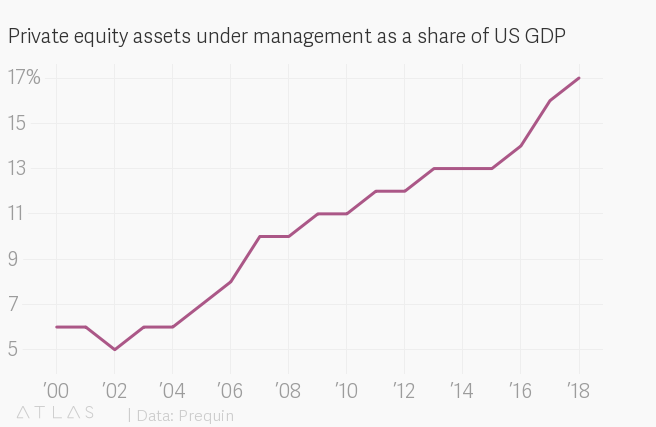 Private equity keeps on growing. Has it gotten too big for the economy? CalPERS, the $360 billion California’s state pension fund, just announced plans to increase its investments in private equity. It’s not hard to see why. Despite the high fees charged by private equity funds, CALPERs claims there are huge payoffs. Its private equity portfolio returned 16.1% in 2017, compared to just 11.5% for its stock portfolio, and it delivered a 10.5% annual return over the last two decades. In the last 20 years, private equity has grown as an asset class, and a once small part of the market is now a major part of the economy. But there is no free lunch in finance, and the rise of private equity may pose risks to the economy, and to the tax payers who will have to make up the shortfalls in public pension funds if their investments don’t pay off.